Two treats for you today: A photo and a video. 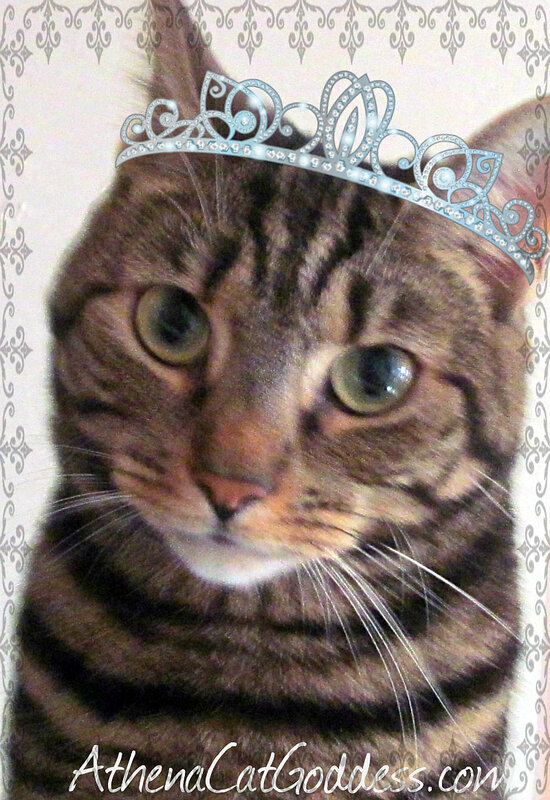 As you can see, my mum thought it would be fun to make me look all regal today. Luckily, the tiara isn't real but added on with photo editing software. And the video, well this is just me being naughty and making my mum laugh. She meant to capture me playing, but instead she accidentally let her camera strap loose. So what can a cat do when she sees what looks like string dangling in front of her face but attack it! It's all a game to us, isn't it my feline fur friends? Good work on that camera strap, Athena! Next time you want to try to disable the flashy box, you might want to consider aiming for the camera lens. Ha. We also cannot resist the dangly things and you did such a great job of catching that camera strap! We are impressed! Luckily, my mum's new camera doesn't need a flash! It was fun! Did you see how big my fangs looked? 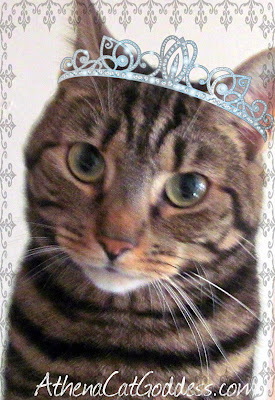 You are lucky, Athena - my human is a Photoshop (semi) wiz - but I STILL have to wear a real tiara for the camera. It's the human's fault, They should know not to leave anything dangling mol. You look furry regal, Athena! You look cute in your crown Athena. Aww... thank you all for your lovely comments. Have a lovely purrfect Saturday! oooh. I like my mommy's binoculars strap. It's bigger prey! She never lets me have the camera strap, but she lets me have the binoculars strap once in a while. As long as I don't let the binoculars go boink! on the floor.